Public parks and open space are important assets to any city and integral parts of the fabric of daily life for residents. The costs to construct these facilities are significant and ongoing capital and operating funds must be invested to maintain them properly. As these costs increase and public funding changes, public agencies are responding with creativity in their operational structures, investment and funding approaches to ensure longevity and programming that is responsive to the community. Many new urban parks opened in the last few year show how public/private partnerships — but not actual private ownership — vastly improve the level of service parks provide to communities. As non-profit stewards of the park, partnerships are responsible for management and maintenance, while the park itself remains fully open and accessible to the public. Through the support of neighboring businesses and/or business improvement districts (BIDs), these collaborative efforts allow for more efficient management, higher level of services and better economic stewardship. One of New York City’s great outdoor spaces, Bryant Park, is managed by the Bryant Park Corporation, a non-profit entity and cooperating business improvement district of neighboring property owners. Formed in 1988 to restore the historic park after years of neglect and decline, the park reopened in 1991 with a budget six times the level under prior city management. With maintenance and management still privately funded today, Bryant Park remains open to the public and the largest effort in the nation to apply private management backed by private funding to a public park. Locally, there are two recent examples of comparable successful partnerships managing award winning parks. In both partnerships, a board comprised of community, civic, institutional and business members governs the entity, while their rules mirror those of District Managed parks. Opened in 2012, the 3-acre Canal Park at 200 M Street SE, is operated by Canal Park Development Association Inc. (CPDA), a 501(c)(3) non-profit organization established for promoting, designing, fundraising for, building and maintaining the park. The $27M to construct the park was provided from a variety of sources, including developer contributions, grants, new market tax credits and a contribution from the District. Today, in addition to being a CPDA partner, local developer WC Smith donates resources for maintenance and management and collects rents, allowing the park to operate without the use of public funds. The nationally recognized 6-acre Yards Park opened in 2011 on the Anacostia River near Nationals Park. Owned by the District, the park is operated by Capitol Riverfront Business Improvement District (CRBID), which is funded by a self-imposed tax on area property owners. Fully open and accessible to District residents and visitors, annual operational funding of approximately $800,000 is provided through voluntary contributions from developer Forest City, CRBID and revenue from park events. In addition to providing events and recreational opportunities for the community, both parks are key elements and public investments in the neighborhoods they serve. Anyone who has been to either Yards or Canal Park is quickly aware of the spectacular appearance and high level of maintenance adding to the overall experience of visiting. We envision McMillan’s parks and open space, as key features of the neighborhood, not just in appearance, but as functional gathering places for the community providing enriching programming and recreational potential. 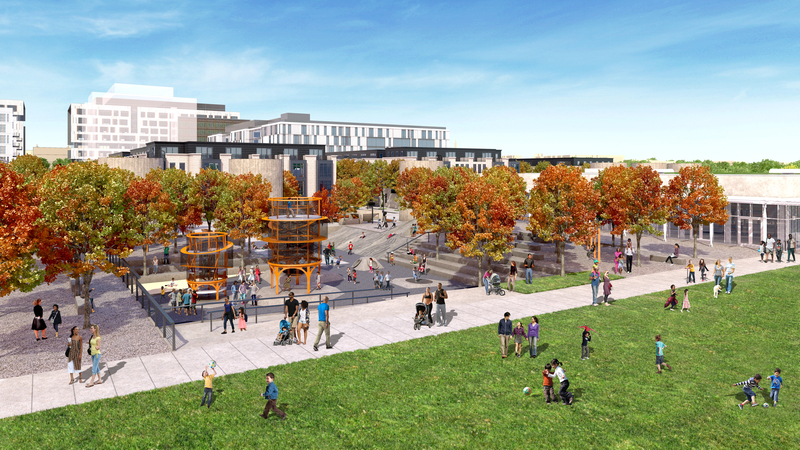 Significant resources will go into the creation of McMillan’s new public space to create a distinctive destination unlike any in the District. As we prepare a framework for the future, what operational model do you prefer to ensure long term stewardship for the public – a collaborative private nonprofit management or city management? Share your thoughts. VMP’s plan creates three parks, including an expansive 6.25-acre central park with a community center and pool. If you add in the South Service Court and other public gathering places, there will be a total of 12 acres of new, public, open and green space. Specifically, of the 3½ block site, the majority – almost 2 blocks – will be open and green space distributed throughout the site. 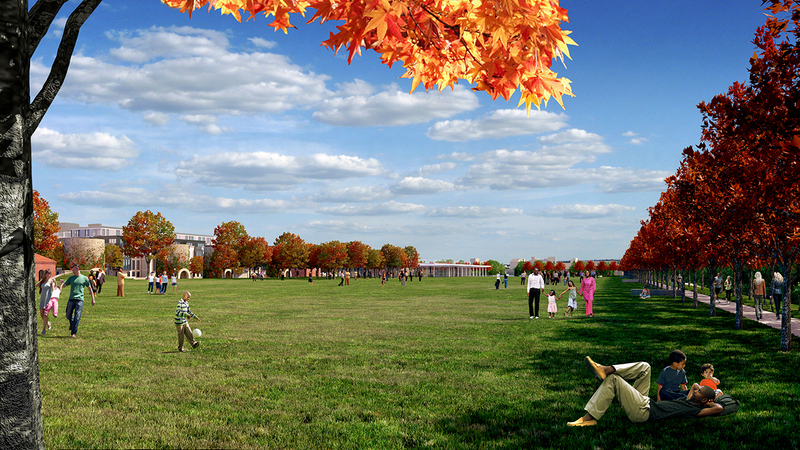 World-renowned landscape architects Nelson Byrd Woltz will design the public green space. They are famous for their work with urban parks, have garnered over 80 national and regional awards and have been featured in many national and international publications. This community will soon have one of the largest and best-designed parks not only in the District, but also in the region and in the country. While there was once a small park on the federal side of the McMillan site (near the reservoir, on the west side of First Street), the McMillan land that VMP is redeveloping was never a park. Historically, it was a working industrial site with manholes dotting the landscape every few feet, providing access for workers to the underground cells. In order to deliver water to the city, the site was in use all day and night, cleaning and pumping water. When the McMillan Sand Filtration Plant first opened, Olmsted, Jr. was commissioned to design a walking path around it that would offer residents a view without disturbing the daily work of the site. 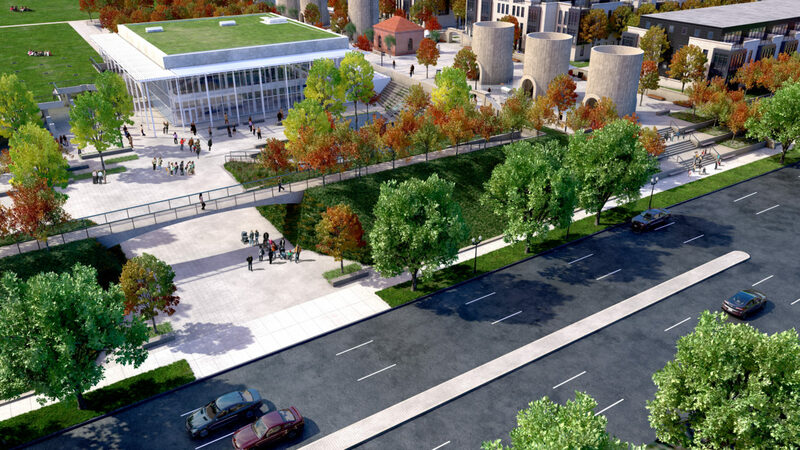 This Olmsted Walk is being restored as part of the plan and will surround the entire redevelopment, connecting the parks and open spaces, providing engaging access and offering tremendous views of both the site and surrounding landmarks. Every step of the walk will be publicly accessible and maintained. Finally, the fences on the site will be down, and there will be a park for residents to use and enjoy. The very foundation of the VMP plan is a $22 million preservation program that will create exemplary design compatible with this historic landmark. The majority of the above grade structures will be preserved. Every silo, every regulator house, every washer and every basin will be preserved and the historic courts will be maintained with special pavers. While the plan includes repurposing of underground cells, it is not feasible to place grocery retail inside the chambers or use the underground cells for foundation. Not only have retailers expressed opposition to the idea of an underground location here from a sales perspective, but the cost of making the cells safe enough for this type of use alone would make rental rates prohibitive for community and retail uses alike. Two underground cells (each the size of a football field) will be preserved, and the current plan includes repurposing Cell 14 for retail use. Cell 28 will be preserved to view through the community center, as part of the planned memorialization. The park will incorporate many features of a “cell with the lid off” as way of further using the unique structures of the site. The VMP plan incorporates water as a theme related to the history of the site. For example, the historic fountain currently located on the federal site will be relocated to the site. 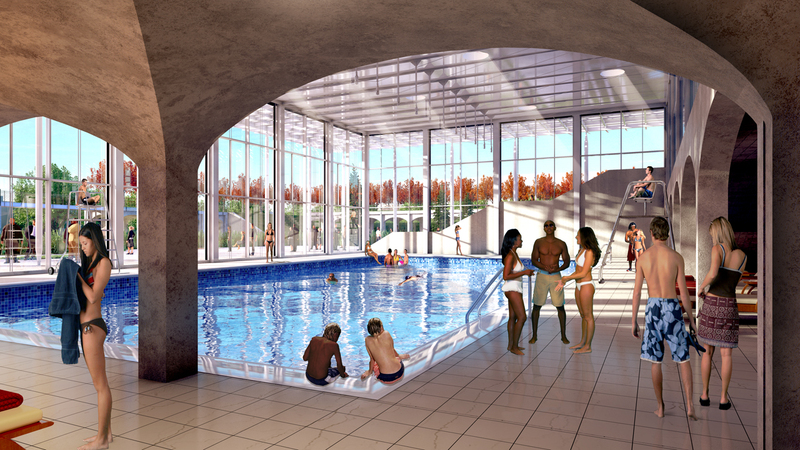 There will be spray grounds for children, a 25-meter pool inside the community center, a bio pond for water management and water features incorporating the historic silos. There will also be historical memorialization, including community-planned and executed self-tours. Buildings will increase in size to the north west of the site, while eastern and southern sides of the plan will step down to work with the scale of existing neighborhoods. Two thirds of the total area of the site will be open and green space. 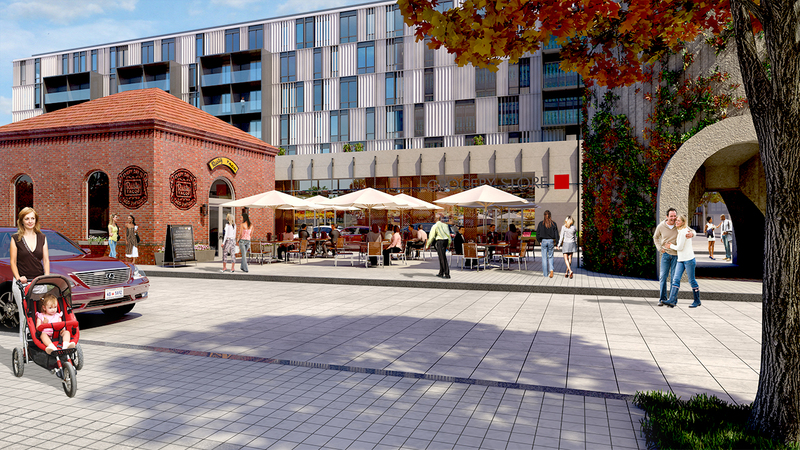 The remaining one third of the site will include local serving retail with a premium grocery store anchor, restaurants, community and cultural space. There will also be housing and offices on site. VMP’s plan will result in 3,200 new, permanent jobs, 3,000 construction jobs and generate $1.2 billion in new tax revenues. 35% of the local contracting opportunities are required to go to certified local, small and disadvantaged businesses and more than half of all jobs created must be offered to District residents. On October 31st, 2013, the HPRB voted unanimously that VMP’s revised master plan and design concepts satisfied their requirements. Because they cannot vote on demolition, they referred the project to the Mayor’s Agent. The project now moves forward to the Mayor’s Agent and Zoning Commission for additional approvals. FICTION: THERE WAS NO PROCESS FOR IDENTIFYING THE DEVELOPMENT TEAM. VMP WAS THE SOLE BIDDER ON MCMILLAN. 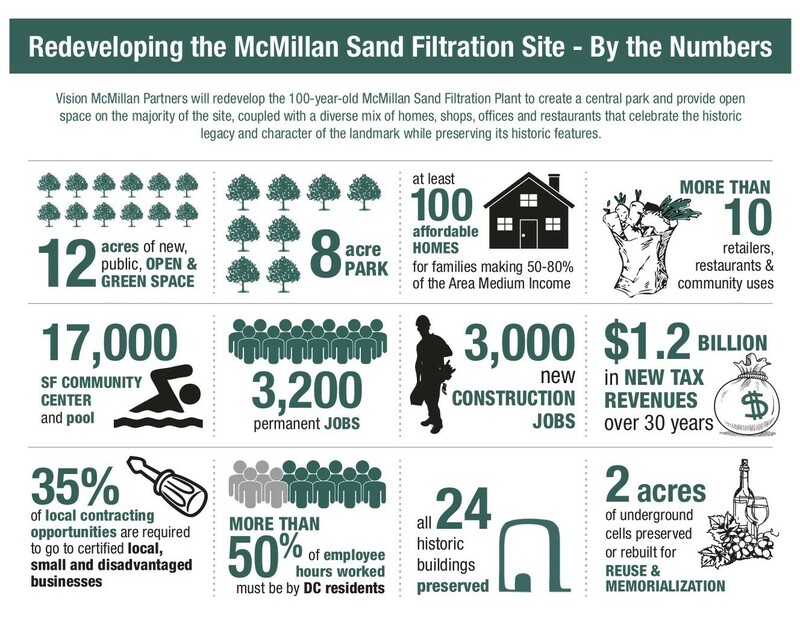 In 2006, the National Capital Revitalization Corporation (NCRC) issued an RFQ to select a development partner for the McMillan site. The selection process spanned several months and included several community meetings and community votes. The initial process was conducted by former Mayor Fenty, signed off on by MAG leaders and later evaluated and held up by former Mayor Gray. The eventual five bidders were judged on their land development capabilities, vertical development capabilities and financial capacity. Community members attended tours of the vertical development projects for all five bidders. 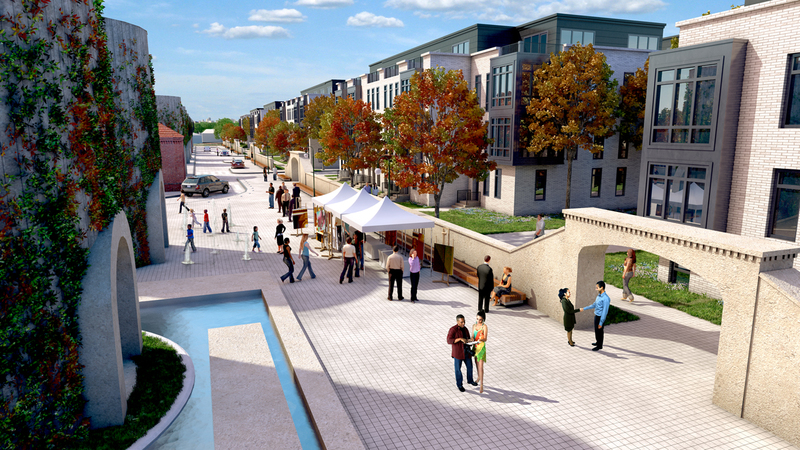 In July 2007, Vision McMillan Partners was selected from among the five bidders by the NCRC because of their collective experience with complex redevelopment projects that present a number of overlapping priorities such as historic preservation and open space.